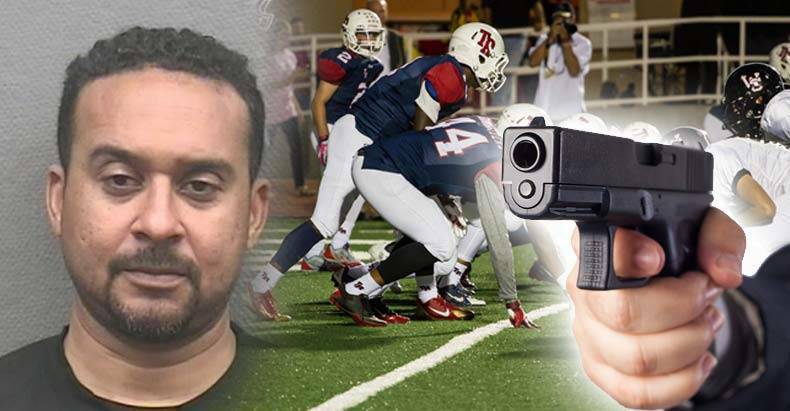 Houston, TX – ATF Agent Marc Delpit is now facing an aggravated assault charge after he beat up a man at his son’s football game and pulled a gun on a crowd of bystanders during the struggle. Delpit claimed that the man and the crowd had threatened him and that he was defending himself, but obviously the crowd of parents saw things differently. According to Houston Police spokesman Kese Smith, a number of witnesses who saw the incident say that it was Delpit who started the fight, punching the other man and knocking him to the ground before the scuffle began. Both of the men are reportedly fathers of football players at St. Thomas High School and witnesses say they became belligerent with each other around halftime. “ATF takes these allegations very seriously, pending the outcome of the investigation, the agent in question has been placed on administrative leave with pay and has been relieved of his firearms, badge and credentials,” Senior Special Agent Nicole Strong of the ATF told KHOU. Delpit has continued to claim that he is innocent and that he attacked the man because he feared that the man might attack him. When bystanders attempted to intervene and break up the fight, he says he felt that his life was threatened by parents who were trying to end the violence. According to Delpit, pulling his gun on the crowd was needed to “keep them at bay,” under the insane assumption that these parents had any intention of hurting him. It is important to point out that anyone without a badge who beats up a teammate’s father and pulls a gun on a crowd of people would look completely insane, but this man is attempting to pass off his actions as justifiable and professional because he happens to be a law enforcement officer.